I first came across the work of Paul Evans when design editor at the East Anglian Daily Times. 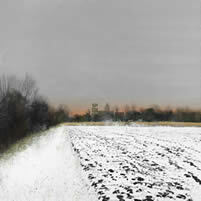 We had been featuring several Suffolk artists and Paul's paintings followed examples of more muted work. If memory serves it was flowerheads and a seascape and the vibrant colours couldn't be ignored. Lovely images but perhaps not specifically East Anglian, I thought. A few years later as editor of Suffolk magazine I got to see some of his landscapes - parts of Suffolk I had driven past, or half remembered from countryside walks - and instantly fell in love with his bold splashes of colour, but also the clever detail too. His summer images almost radiate warmth, the sort of blissful, balmy days that take you back to childhood. I don't know whether the azure skies and flower speckled meadows make this an easy time of year to portray but winter certainly doesn't limit Paul's creativity. Here we are in the colder months, and Paul, as this book and his latest collection of paintings proves, is truly a man for all seasons. He gets to grips with a so called barren time of year, coaxing wonder out of seemingly ordinary settings and, on first glance, limited colour palettes.